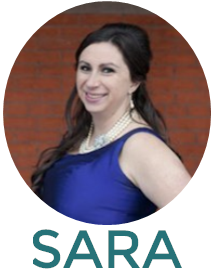 A Bedazzled [kind of] Life: 36. wedding + football = theme. I'm from a tiny dot on the map outside of Philly. I love the Eagles and am nothing less than diehard for the Phillies. My hubby is originally from Queens and grew up in Jerz. He loves the Yankees, Knicks, Rangers...and the Colts - but we don't hold the Colts against him. It's an understatement to say we disagree on sports. 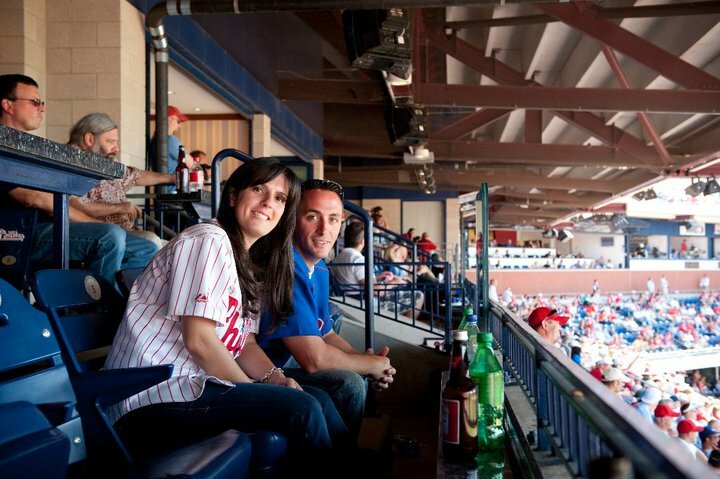 I'm surprised our engagement survived the 2009 Phillies vs Yankees World Series. He loathes Philadelphia and frankly, I'm relieved he doesn't like the Giants or the Mets. That would damper our future. And while he swears up and down that I made a bet on said WS 2009 that I would wear a Yankees veil if we lost...the idea of trying to filter our mutual love of sports into our wedding was dead when it hit the water. (PS just reading this to him..."oh you want to bring THAT up again...you MADE the bet") -- I didn't. But perhaps you're different. And you and your future significant other can figure out a peaceful way to incorporate your team love into your wedding. I'm jealous. Engagement Photos...I love this shoot - Kristin & Pete are getting married April 30th (they were featured in my 2011 wedding special) and their engagement photos are probably some of my favorite I've ever seen! 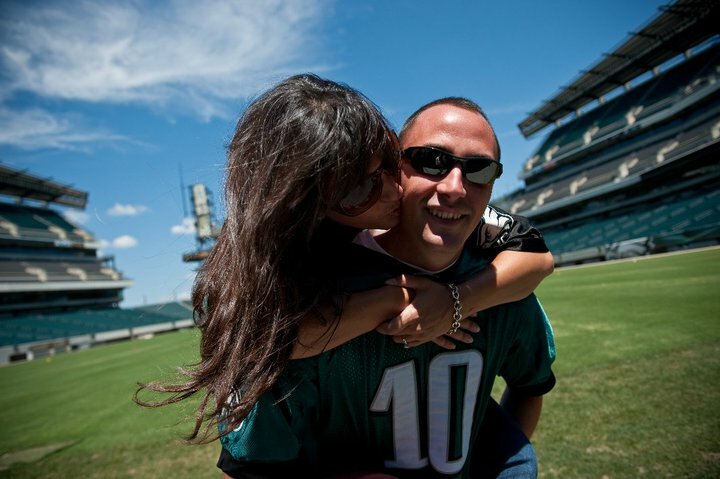 Luckily, they are both Philadelphia sports fans...so it was perfect. There are many ways that you can add all sorts of crazy things on your big day. 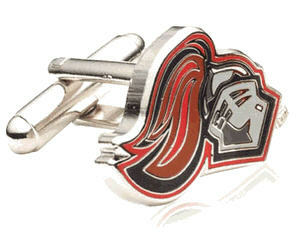 My friend sent me this web site and I was clicking around and saw Rutgers cufflinks. I thought of my 3 friends Mark, James & Mike instantly. Well...they have to be engaged first. 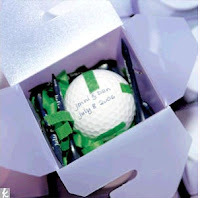 Favors...do you two love to golf together? Or are you big baseball fans? Why not make your favor a golf ball and a few tees. Or a brand new baseball. It's cute - and most importantly, useful. Attire...Before you go "WHAT?" -- let me clarify...I don't mean make the bridesmaids dresses out a your favorite teams jerseys....what I can suggest is subtly mix in the colors. 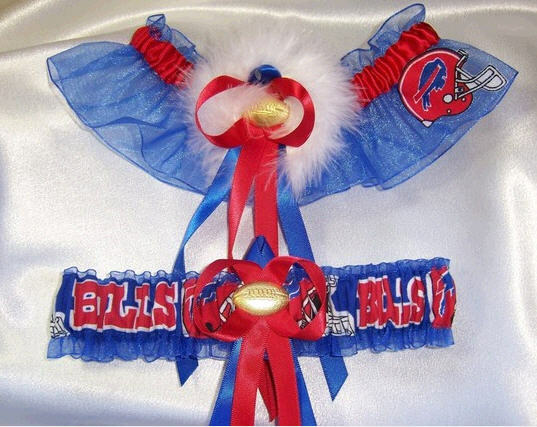 For example, If you are a Eagles fan...your girls can be in emerald green and for the flowers you can splash a few white flowers in between. 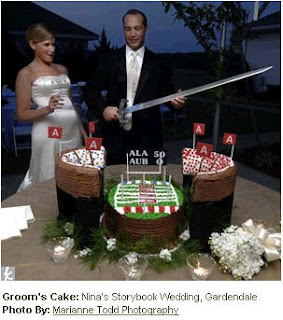 Groom's cake...always a cool addition. 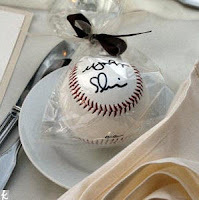 You can turn the groom's cake into a dedication to the sport team - or teams of choice. 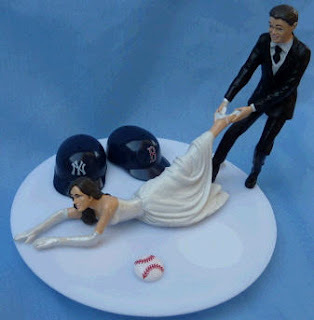 Cake Toppers...On Fun Wedding Things web site...you can get some really cool looking cake toppers. 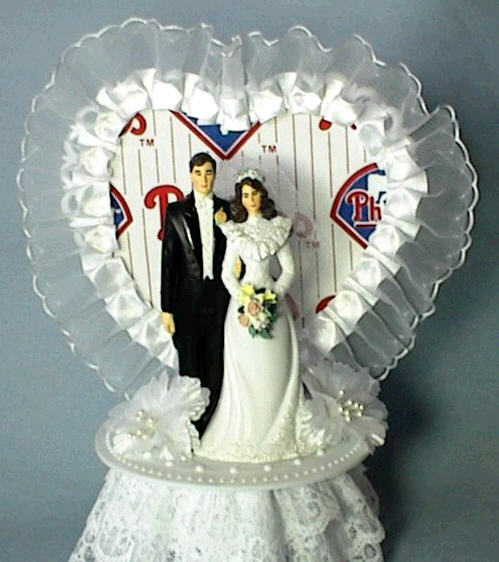 Perfect for a couple who loves two rival teams..or share a mutual love of one sports team. And lastly, Bridal Garter's...perfect for the toss garter...and the one to save for later. Garters by Kristi on Etsy has a great selection on ones to choose from.